Designers Mac Cox and Ben Rigby are possibly one of the lighting world’s best kept secrets. Working under the collective Haberdashery, Helen Fletcher discovers how their new venture will push the studio’s philosophy to the next level. Lighting design agency Haberdashery might just be one of the industry’s best-kept secrets, with the studio’s prolific output of lighting sculptures having remained strictly behind (residential) closed doors for the past nine years. 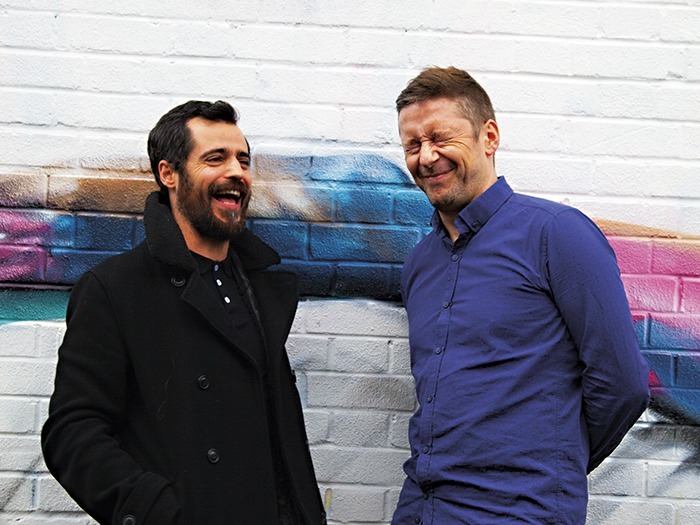 Co-founders Ben Rigby and Mac Cox are the driving force behind the 24-strong team that makes up the London-based studio and with their very different routes to market and design influences playing an important role in the company’s style and techniques, it’s easy to see how Haberdashery has grown into something quite extraordinary. Having met on a film set in 2007, the duo’s creative story starts much earlier in life with Rigby growing up in Reading, UK and Cox in Mexico and Spain before heading to London at the age of ten. “I was a quiet, introverted child fascinated by drawing and I fanatically compiled hand drawn guide books to birds of prey, the deep sea world, poisonous animals and the like, before getting swept up in the romanticism of exploration with further reams of sketches and illustrations about space, travel and lost worlds,” Rigby tells darc. A steady passion for creativity saw Art and Design as Rigby’s main subject through school and he went on to study a Foundation Art course at Thames University, all the while teaching himself photography. “I went on to study editorial photography at the University of Brighton,” he continues, “but this was a course I didn’t finish as I embarked on several real world projects that took me away from day to day studying and has left me with fewer qualifications on paper than anyone I work with! As a particularly insular subject, photography allowed Rigby to continue to look at the world through his own porthole and explore the narratives he could uncover through the medium of light. “It has given me a great eye for detail,” he says. “Along with an obsession for narrative, for the subtext and the hidden meaning behind things put in front of us”. For Cox, an education at Central St Martin’s College in London, doing a foundation and then degree in Product Design, saw him make the move straight into the film industry, working his way from Art Department Runner to Art Director within a few years. “I mainly worked on Pop promos for people like Travis, Audio Bullies and 50 Cent to adverts for Persil, Walkers, Mini etc and was fortunate enough to work on the new Thunderbirds film and Tim Burton’s Charlie & The Chocolate Factory,” Cox tells darc. “I vowed never to enter the design world after university but seven years later we started Haberdashery. I decided I wanted a bit more creative freedom and to play with bigger budgets to feed my imagination… It was the perfect mistake! With Cox drawing inspiration from the likes of Bridget Riley for her playful obsession with colour, simplicity and composition; Ai Weiwei for his political artistic rhetoric and dogmatic execration; and Mark Rothko to name just a few, Rigby is inspired by studios that work together to create something unique, telling darc: “In my twenties, studios such as Tomato (graphics) and Heatherwick were inspirational. These days I appreciate visionaries such as Olafur Elliason or James Turrell because they achieve such clear, timeless results. It is this inspiration found in nature that brings Haberdashery’s latest venture to life. Whilst publically known for their bone china Leaf range of lighting sculptures (covered in issue 15 of darc), contemporary lighting products have not come out of the Haberdashery stable until now, with all other works to date being 100% bespoke. Inspired by the memory of natural light, Evoke is a collection that calls on light manipulation in order to tell a simple story. The first product in the Evoke range is the Canopy pendant, which launches at Top Drawer in London, January. Recreating the effect of dappled light falling through a forest canopy, a specially designed LED display creates a slowly animated pattern of light across a hand blown glass shade, with task lighting falling on the surface below. Seen by many in the industry as artists, designers or makers, Rigby and Cox would ideally prefer their work do the talking, but this has been challenging for a secretive (until now) entity such as Haberdashery. “The challenge we face as artists and designers is to communicate a consistent philosophy through our creative process,” says Rigby. “If we do this, we can approach a broader range of projects without losing a sense of what we stand for and the viewer can understand who we are and what matters to us. With a philosophy based on play, you may wonder how this functions in the workplace… Well the design studio adopts a very flat company culture, resisting the temptation to become just another corporate structure. Instead, Rigby and Cox champion, ‘what if’ moments and encourage the designers to be ambitious wherever possible, always challenging the norm. While the design duo might share the same work ethic and creative optimism, their very different ways of working is what makes them unique. “It’s good to be different as we can learn from each other,” says Rigby. “Mac and I share a feeling for when to take risks and when to hold back, it is essential to take big leaps of faith in design but to be calculated in when you take them. We are both along for the thrill of the ride as much as the end result. “When we create a bespoke sculpture we are looking to create that ‘how on earth did they do that’ moment in the viewer, that slows down time and absorbs them in the moment,” says Rigby. “A good product should have a little sprinkling of this, combined with a clean, resolved simplicity that the design process can bring. It should be a beautiful object, a useful light and have real personality”.